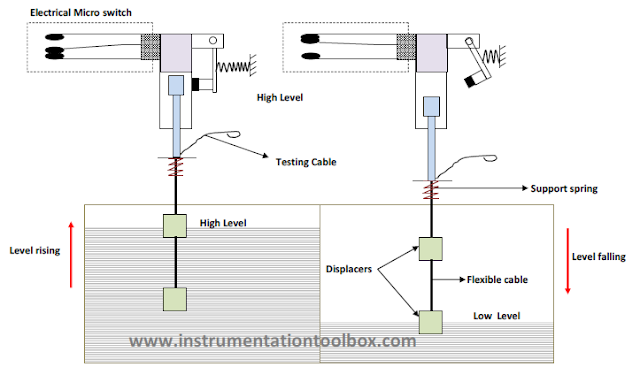 Float level switches and sensors operates based on Archimedes principle. The apparent weight of a floating object is reduced by the weight of the liquid displaced. Archimedes’ principles states that the buoyant force acting on an object equals the weight of the fluid displaced. As the level changes around the float and displacer materials, the buoyant force varies in proportion and can be detected as an indication of level. 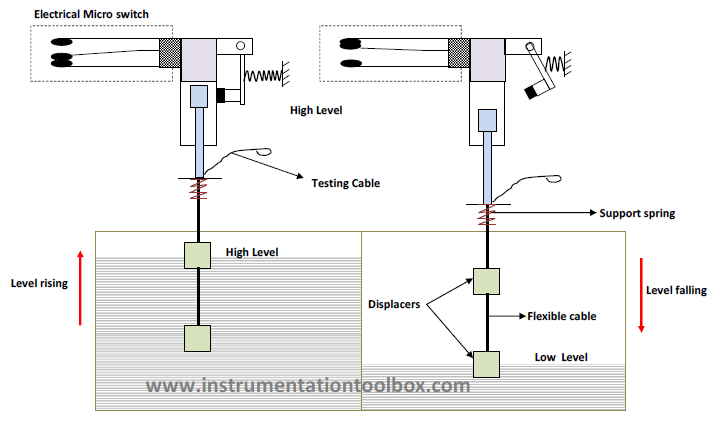 Floats are commonly used for point level indication while displacers can be used for continuous as well as point level indication. The buoyant force available to operate a float level switch is the difference between the weight of the displaced fluid (gross buoyancy) and the weight of the float. Floats and displacers are available in spherical, cylindrical and a variety of other shapes. Standard float sizes are available from 1 to 5 inches in diameter. Custom float sizes, shapes, and materials can be ordered from most manufacturers. They can be made out of stainless steel, Teflon, Hastelloy, Monel, and various plastic materials. Floats should always be lighter than the minimum expected specific gravity, SG, of the process fluid. For clean liquids a 0.1 SG difference is desirable, while for viscous or dirty applications a difference of at least 0.3 SG is recommended. This allowance provides additional force to overcome the resistance due to friction and material build-up. In dirty applications, floats should also be accessible for cleaning so as to increase the efficiency and effectiveness of the float mechanism. electrical, pneumatic, or mechanical mechanisms or switches. The switch can be mercury, dry contact, snap-action or reed type hermetically sealed, or pneumatic. 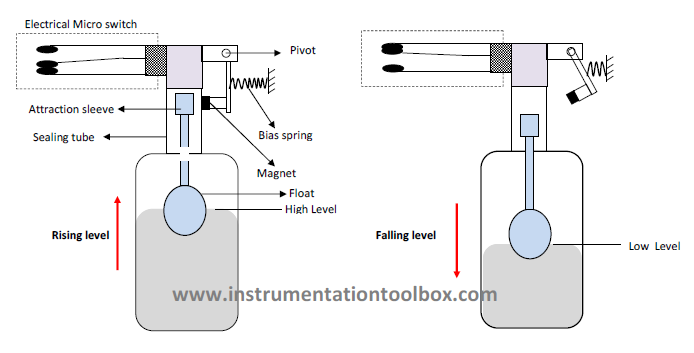 As shown above, as the process level rises, the float with the attraction sleeve rises with it, and the float magnet pivots down, which attracts the switch magnet actuating an electrical switch contacts in the process. 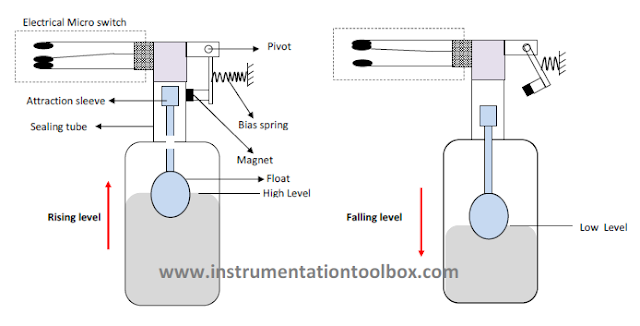 When process level falls, the float and the attraction sleeve falls and the bias spring retracts the magnet in a snap action deactivating the electrical switch. This type of float level switch is completely sealed and well suited for heavy duty industrial applications up to 900 psig and 4000C (7500F), meeting ASME code requirements. These switches can be side, top, or cage mounted and can serve both alarm and control functions on steam drums, feed water heaters, condensate pots, gas/oil separators, receivers, and accumulators. When liquid level in the tank falls, the weight of the displacers increases and the attraction sleeve is pulled out of the sealing tube. The bias spring immediately retracts the magnet in a snap action causing the electrical micro switch to actuate again. Displacer float switches are used to detect high and low levels in vessels and tanks.Displacer switches are more reliable than regular floats on turbulent, surging, frothy, or foamy applications. Changing their settings is easy because displacers can be moved anywhere along the suspension cable. Displacer switches are interchangeable between tanks because differences in process density can be accommodated by changing the tension of the support spring.